It’s been a while since I showed you my eats for a day. Yesterday started with a super yummy breakfast. I picked up some of the last summer berries at the weekend farmer’s market, so I enjoyed a dish of strawberries, raspberries, and blackberries. They were incredibly sweet. 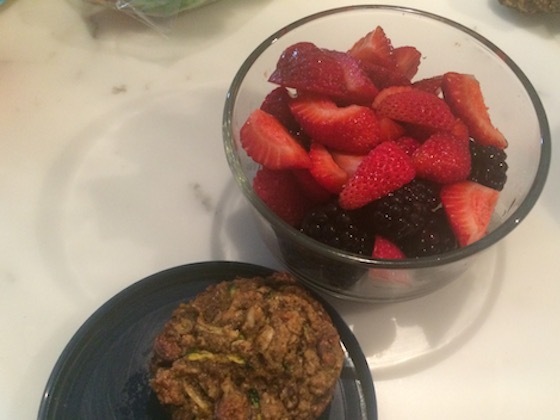 I paired the fruit with an awesome banana zucchini muffin that’s full of produce, has no refined sugar or flour, and is vegan! I’ve been experimenting with packing my lunch this week. Yesterday, I brought leftover noodles with an asian peanut sauce. I paired this dish with lots of fresh veggies, an apple, and a cinnamon raisin energy ball. I’ve been trying to fit more produce into my diet, and packing a lunch has definitely made this easy! 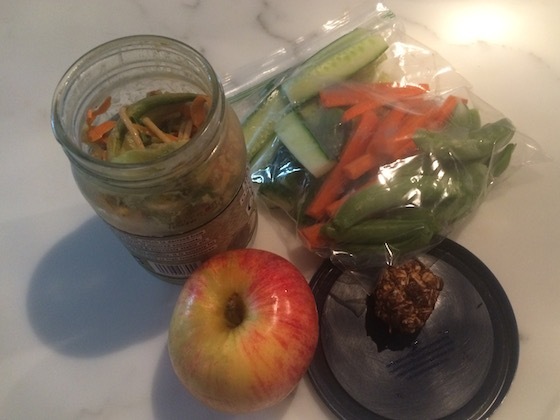 I enjoyed the noodles, apple, and energy ball around noon, and saved the veggies for an afternoon snack. I was starving by the time I got home from work, and cold, too – it started drizzling as I was walking from the bus. I whipped up this quick, warm, and satisfying dinner. 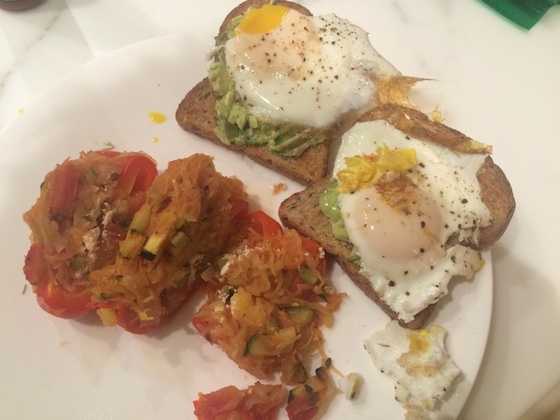 Two pieces of toast topped with avocado and fried eggs, plus a pepper stuffed with spaghetti squash. The pepper was a weekend experiment that turned out really well – let me know if you want to see the recipe! After taking this photo I added lots of hot sauce on top. I’m currently loving the Trader Joe’s chili hot sauce. It has a good kick but isn’t way too hot, and there’s a hint of sweetness, too. 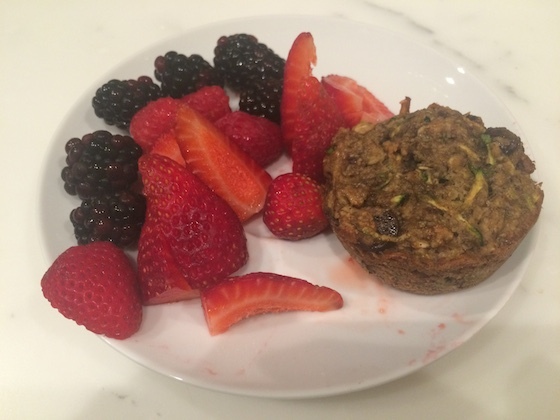 Later in the evening I enjoyed a snack of more berries and another muffin – I guess I really did love that breakfast combo! I’m starting to get really excited to experiment with new fall recipes. Let me know in the comments what you’ve been eating recently!